Darjeeling: Binay Tamang on Thursday held "very fruitful" meetings with the state government in Calcutta on GTA-related matters in an indication that development will be speeded up in the hills after months of disruption. Tamang, accompanied by Darjeeling MLA Amar Singh Rai, Kurseong legislator Rohit Sharma and School Education Board chief Tshering Dahal, met finance minister Amit Mishra, education minister Partha Chatterjee, home secretary Atri Bhattacharya and the principal secretary of the fire department, A. Roy. "The meetings were very fruitful. We discussed problems related to education in the hills, including those faced by voluntary, para and ad hoc teachers. The minister (Chatterjee) was aware of the problems and the issues will be solved in a phased manner," said Tamang. The voluntary and ad hoc teachers have been demanding regularisation of jobs, a prime concern as many posts are yet to be filled with regular teachers in the absence of the School Service Commission in the hills for more than a decade. The GTA delegation discussed development matters with finance minister Mitra. "We discussed various projects related to the GTA's annual action plan of 2017-18 and 2018-19. The minister (Mitra) agreed to release the remaining funds of the GTA," said Tamang. Issues related to increasing the salaries of doctors and engineers and other employees of the GTA were also discussed. The state government agreed to set up three fire stations in the hills, at Gorubathan, Algarah and Sukhiapokhri. "During our meeting with the state fire secretary, we were told that the process of setting up the fire station at Gorbuthan has been completed and only tenders need to floated. There seem to be land-related problems in Algarah and Sukhiapokhri but at Thursday's meeting, it was decided that efforts would be made to solve them as early as possible," said Tamang. Thursday's meetings marked the second round of talks in just over a week between the government and the Tamang-led GTA team. Chief minister Mamata Banerjee had held several meetings with GTA, the district administration and chairpersons of community boards during her visit to the hills last week. "After these meetings, we are hopeful that there will be major changes in the hills," Tamang said. 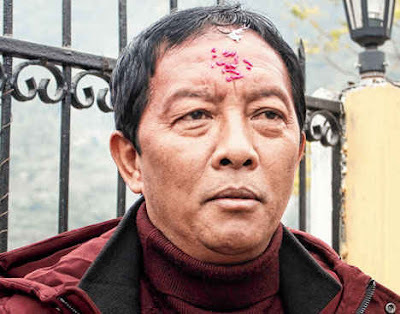 Binay Tamang on Thursday held "very fruitful" meetings with the state government in Calcutta on GTA-related matters in an indication that development will be speeded up in the hills after months of disruption.